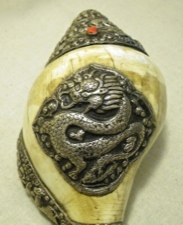 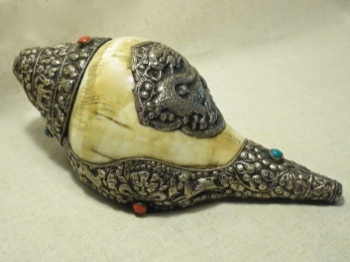 Tibetan ancient conch shell used as a ceremonial trumpet to call worshippers for religious assembly. 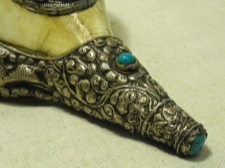 Embellished with amazing repousse' workmanship of dragons, the entire zodiac, ornamental details and inlaid turquoise and mountain coral. 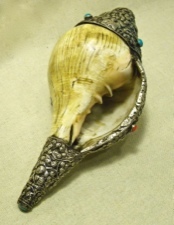 This shell is 9 inches long and 12 inches around its widest diameter. 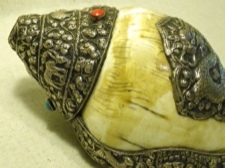 This relic is in excellent condition, a wonderful example of quality Tibetan craftsmanship.